I’m sure most of you would have heard of A.A.Milne’s classic Winnie-the-Pooh stories he wrote for his son, Christopher Robin. Although Winnie-the-Pooh is the most famous character, there was also a tiger called Tigger, first introduced in The House at Pooh Corner. Tigger was stripey, energetic and bouncy. When I was about 10, I was given a stripey jumpsuit which I fell in love with and wore as often as I could. At this stage, I was also very energetic, bouncy and more than a little clumsy. 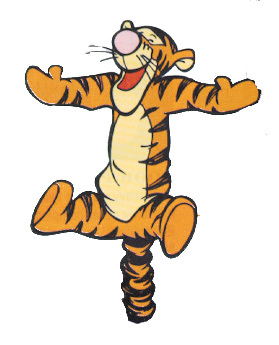 Somehow Tigger became my family nickname. As I got older this was shortened to Tig. My family and close friends still call me Tig and I much prefer it to Robyn.